Published in Argentina, Spanish language, July 4, 1967, #102 pages, 8.6" x 5.6" tall, CANAL TV MAGAZINE presents. "The Time Tunnel", spectacular cover! 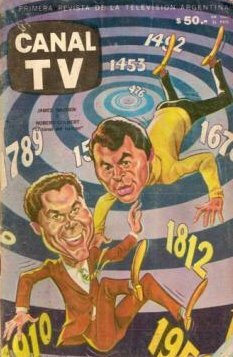 The cover drew the best Argentine sketcher of all times, JORGE DE LOS RIOS, and is the uniquecover in which the famous televising series, The Time Tunnel, were drawn in caricature cartoon! This magazine is almost impossible to obtain. Very unique!